1/ "One dialogue, two conversations" phenomenon. Karthik gets romantic - "Naturally ... love is blind ... if you are not comfortable you can close your eyes ... No, No, its superb"
Siva gets awe : "Mostly I should be mad at you, but I respect you ... so you live long"
2/ The first 30 seconds is like a massive intro (build up) for the protogonist. Karthik choses the characters to explain his hero. Siva goes monologue - just like Ajith-Siva previous films (Ajith Voice sema gethu). 3/ Both trailers hold a mystry including 2 different makeover for the protogonist. Karthik's potrayal increases the curiosity and demands attentiveness. Siva's depiction expands the interest showing firmness. Karthik gives a glance of the object as something symbolic yet to be revealed, while Siva commucates by placing a glass of milk opposite to the tea glass. Karthik produces contrasting colors to show the shades of the characters. Siva choses colours as a design for his frames. Karthik organises closed enviornment shootouts - Church, furniture disposal room, etc. Siva goes for cage fighting and lavatory brawl (Ajith fight sequences are always awesome, looking forward for this one). 8/ so on so forth (I stop here) ... its quite a neck to neck with both the trailers with thundering dialogues uttered by the two favourite heroes. Karthik is subtle while Siva is obvious. Both the trailers show the writing prowess of these young film makers. When Petta trailer is "Pattassu", Viswasam trailer is "Erimalai". All the best to Ajith, Nayanthara, co-artists, Siva and Team Viswasam for a grand sucess. This Pongal (Jan 10) shall be a memorable one as I would watch both the films with a group of awesome fans who don't care about sucess, storm or cold but just Ajith. All the best to Night Ed Films and I am confident that the first film this year will earn profits for the company. - Regular shows from 10/01 in CGR/Eurocorp/Gaumont-Pathe throughout France [Booking should start from tomorrow]. 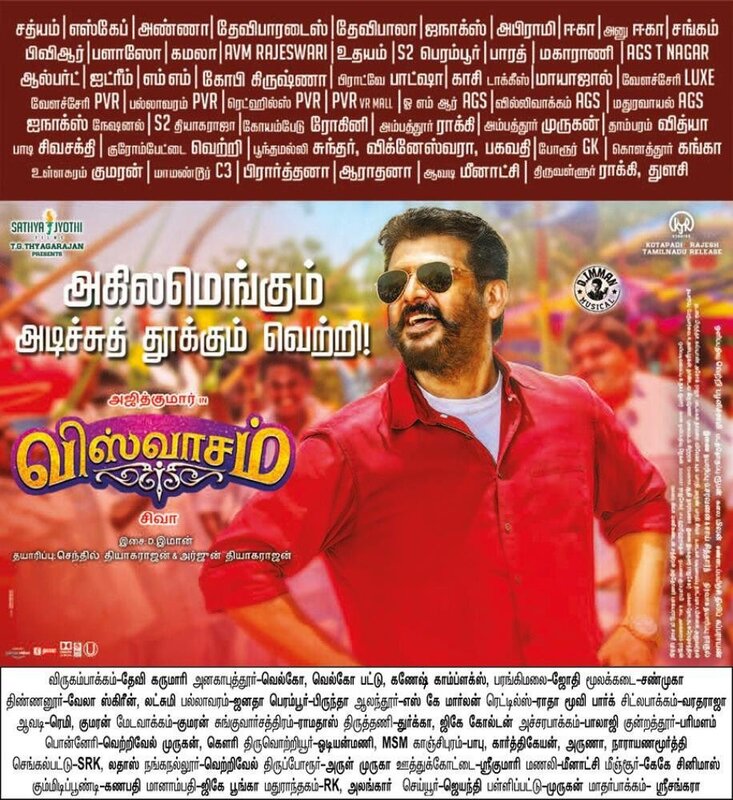 An excellent distribution by Nighted Films to accomadate Viswasam in all major movie theater chains in France. Pondatti peru niranjana ponnu peru swetha.